White ink pen explosion! Everything was going great until I decided to add some white! Yikes! You can’t wipe that stuff off either, so I had to figure out a way (quickly) to save what I had. I did the best I could. So, this turned out differently than planned, but sometimes that happens. #AJChallenge Day 17–draw a recipe. Minneola’s are in season, and I had one to draw from. This smoothie recipe is easy and delicious. Thinking about a piece to start out with for my body of work plan. I think that I am going to do some dandelion sketches and then an 8 x 10 finished work. For the finished work I really need to decide on medium. I am thinking watercolor and ink pen. It’s so hard for me to think of just using one medium for a cohesive group, but it seems like the right approach. Since I am headed to Hawaii soon I will have to work on a couple of pieces that are more tropical. Maybe I can make this a second body of work…one that might come together more slowly. 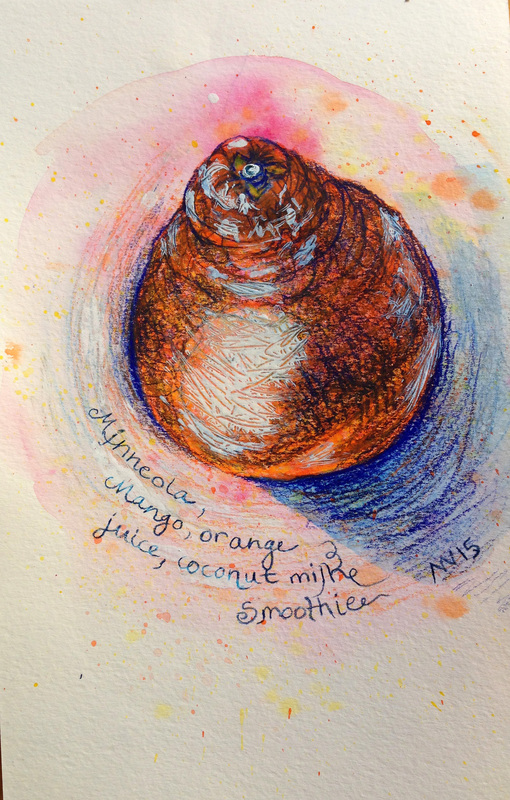 This entry was posted in #AJChallenge, art, art journal, fruit, small painting and tagged #ajchallenge, art journal, colored pencil, inktense, minneola, moleskin, recipe, sketch, smoothie. Bookmark the permalink. Love the effect you got with the white I’ve had that happen too, it’s strong stuff that white ink! thanks, it was kind of a surprise! I have used the pen before without mishap, but now I know to be cautious.